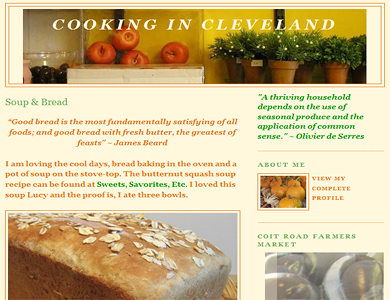 OhioMom is a food blogger from Cleveland, Ohio. She blogs about the local food movement. Buying locally ensures that her food dollars go directly to the family farmer as well as providing her family with fresh, unprocessed food. She shares easy to create meals and baked goods with seasonal, locally grown produce from her local farmers markets. OhioMom also has a urban rooftop container garden where she grows a variety of vegetables and herbs to use in her cooking.